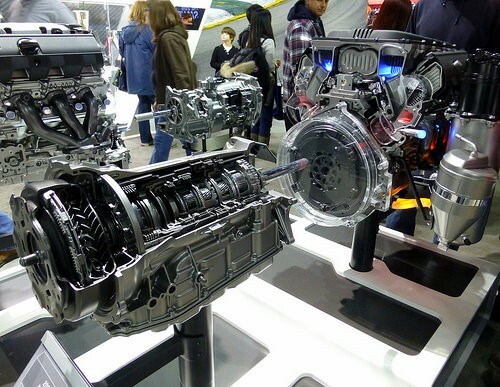 The gearbox that delivers the output of a vehicle's engine to the drive wheels, the transmission, adjusts a car's engine speed to the wheel speed and is an integral component in every vehicle. When a transmission falters, your car falters. It is imperative that a transmission works correctly, and when it needs replacing, the damage can be costly. For many, taking their vehicle to a mechanic is the only option to fix or replace a transmission, but that option can often involve astronomical costs. Car-savvy drivers who have the know-how to rebuild their own transmission are in a position to potentially save thousands of dollars compared to costs they'd incur at a repair shop. For those who know how to do it, repairing their own transmission is also a massive time-saver compared to taking it to a local garage, where their car is one of many in the shop awaiting servicing. Transmissions are a complicated assemblage of parts, and a detailed manual is essential before even an engine-literate individual can undertake the challenge of a rebuild or repair. Rebuild kits are usually priced around $50 to $300, depending on what parts are included. Doing it yourself could cost less than $500. How do you rebuild a transmission? What follows is a general write-up about rebuilding a transmission. It is intended to be informational in purpose, and your vehicle may require additional or alternate work. Our transmission rebuild instructions are based on a front-wheel drive, automatic vehicle. When undertaking such a project, it's always advisable to have a vehicle-specific manual for reference. Step 1) To remove a transmission on most cars, drop the transfer case and remove it out the bottom, unbolt the engine mounts, unbolt the transmission from the crossmember and then unbolt the crossmember from the frame. Step 2) Pull the engine and transmission as a single unit, following the transmission with a bucket to catch the fluid, then set the transmission on an overturned 5-gallon bucket and separate the engine from the transmission (unless you plan to save the torque converter, in which case you may choose to hold it on the transmission for the time being so nothing important is damaged in the process). Step 3) After the transmission is out, set the entire transmission in a bucket with the tailshaft assembly pointed down to drain out the rest of the fluid. Step 4) With the transmission upside down, unbolt or pry off the pan. The valve body has to be removed from the transmission before it can be rebuilt. The valve body is held on by a few bolts on each end and has the park lock rod attached to the manual shift detent by an e-clip. Remove the entire valve body without removing the park lock rod from the valve body, and then the rod should just slide out. Step 5) Take the valve body apart, carefully clean it and then put it back together. Step 6) The tailshaft assembly is the short, aluminum housing typically located on the rear of the transmission that adapts the transmission to the transfer case, which houses the parking sprag, the governor, a ball bearing, a seal and some of the output shaft. Take off the six bolts attaching the tailshaft assembly to the main case and slide the tailshaft assembly off. Clean it and then reassemble it. Step 7) From here, you will begin to encounter a lot of bigger parts that will need to be taken apart before being reassembled: the accumulator piston and spring, the front pump, the front band and front clutch, the input shaft and rear clutch, the driving shell and output shaft assembly, the rear band and drum, the overrunning clutch, the front and rear servos and the planetary gear assemblies. Before reassembling, clean and inspect every part. Step 8) Once the transmission is taken apart, the majority of parts are replaced, which may or may not include all the parts disassembled and cleaned; all clutch plates and bands replaced; all seals, gaskets, and sealing rings replaced; and all solenoids either cleaned and tested or replaced. Transmission overhauls are not for the faint of heart, nor are they for the impatient: rebuilding a transmission can take several days or more.